Ram has unleashed a new beast in the fight for truck supremacy. The new 2019 Ram Heavy Duty arrives just as the Ram 1500 takes top prize as North American Truck of the Year. The new Ram Heavy Duty sets new standards in the battle for bragging rights. Ram says the 3500 can tow an amazing 35,100-lbs. and carry 7,680-lbs. Yeah, it’s got a HEMI in it or a 6.7-liter Cummins Turbo Diesel. Ram is upgrading the 2500 and 3500 the same way that it improved its award-winning 1500. It is using high-strength steel and lighter weight materials, including aluminum hoods to reduce overall weight by up to 143 lbs. The 2019 Ram Heavy Duty is available in six different grille styles. Ram is adding redesigned luxury interiors with premium finishes to attract buyers who are keeping their trucks longer and want an upgraded experience. Ram is also adding noise-cancelling and anti-vibration equipment to give drivers a quieter and more comfortable cabin. The 2500 and 3500 also claim to have the largest amount of in-cabin storage space in the industry. The RamBox Cargo Management System includes versatile, weatherproof, lockable, illuminated and drainable storage bins built into the bed rails. New for 2019, RamBox features a 115-volt outlet with up to 400-watts of power. The new interiors feature loads of new technology. The 2019 Ram Heavy Duty features the Uconnect 4C NAV on a 12-inch fully configurable touchscreen, which can display one application, such as the navigation map, across the whole 12-inch screen, or can be divided in half, operating two different applications at once. Ram specifically designed this screen, also featured in the Ram 1500, to be large enough to be easily operated, but not so big that it is distracting to the driver. Buyers can also get a 7-inch, full-color, 3D animation-capable instrument cluster. Drivers can reconfigure their instrument panel to personalize the information they want to see. The display is designed to visually communicate graphics and text, quickly and easily. New 360-degree surround-view camera with trailer reverse guidance view provides a single display-screen view of both sides of a trailer to assist drivers in maneuvering towing setups. New auxiliary exterior camera improves visibility with custom positioning in and behind trailers. 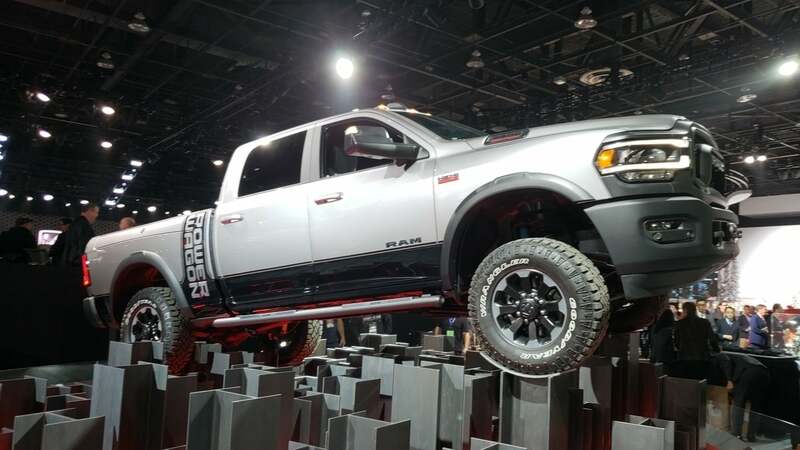 Ram says the 2019 2500 and 3500 models have more than 100 safety and security features, including exclusive active safety systems including adaptive cruise control, Forward Collision Warning, Automatic Emergency Braking (AEB) and AEB with trailer brakes. Real truck lovers will tell you that the big draw is all about performance and capability and the new Ram 2500 and 3500 have plenty of both. The new Cummins 6.7-liter I-6, high output Turbo Diesel delivers up to 1,000 lb.-ft. of torque @ 1,800 rpm and 400 horsepower @ 2,800 rpm. The standard engine in the 2019 Ram 2500 and 3500 Heavy Duty is upgraded to the 6.4-liter HEMI V-8, delivering class-leading 410 horsepower and 429 lb.-ft. of torque. Ram did not release fuel economy ratings. The 2019 Power Wagon features a factory suspension lift, locking front and rear differentials, disconnecting sway bar and a 12,000-lb. winch. New to the Power Wagon is a 360 camera, which includes forward-view camera gridlines to help navigate obstacles. An all-new and integrated front-mounted WARN Zeon-12 winch features a new synthetic line that cannot kink, does not fray and is more maneuverable. The new line also cuts weight by 28 lbs. A Power Wagon content package continues to be available on Tradesman, which includes all the off-road equipment but keeps the Tradesman design elements. The 2019 Ram Heavy Duty is built at the Saltillo Truck Assembly Plant in Mexico.